The markers generated were required to monitor and control a baking line; improve production consistency and provide information for the proactive adjustment of formulation and oven profile to maintain an ‘ideal’ texture. 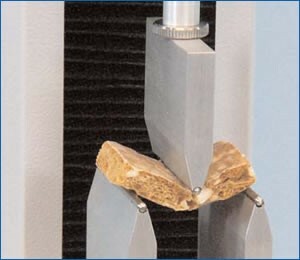 The snap characteristics of hard and brittle cookies were evaluated using a three-point bend assembly as an indicator of bake profile. The cookie sample is supported at two points. The travelling beam moves down at maximum speed and snaps the sample creating a single massive fracture. Crispness / Brittleness - Break characteristics can be used to optimise product formulation and handling during manufacture e.g.optimised mix times, oven profiles and starting moisture contents. 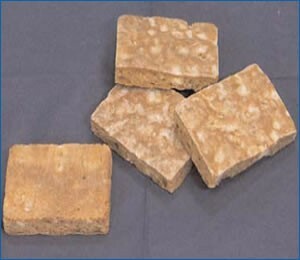 Hardness / Break Point - Properties evaluated over shelf-life demonstrate the effectiveness of packaging in preventing moisture penetration from atmosphere in brittle products. Fracture - Break properties can be used to determine sensory preference during development. 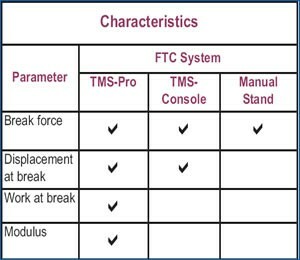 Conditions imposed by the TMS-Pro texture analyzer together, with good experimental design accommodated natural variation in the sample set. A snap test was proposed to break the cookies at speed, creating a single massive fracture. Sample variation was removed from the three sample sets. Each batch was checked for size, surface properties, breaks and presence of large particulates. The method followed has demonstrated a clear difference between hard and soft cookie samples. The differentiation between soft and ideal product is much smaller and highlights the need for large sample sets. The deformation to break in the ideal and soft samples is much greater than that of the hard product. This is also reflected in the work characteristics where the hard and much more brittle samples fractured and failed very quickly in comparison to their soft counterparts. Repeating this technique is dependent on test speed. It is essential to cause a massive fracture and not propagate small breaks if clear differentiation between samples is to be made.